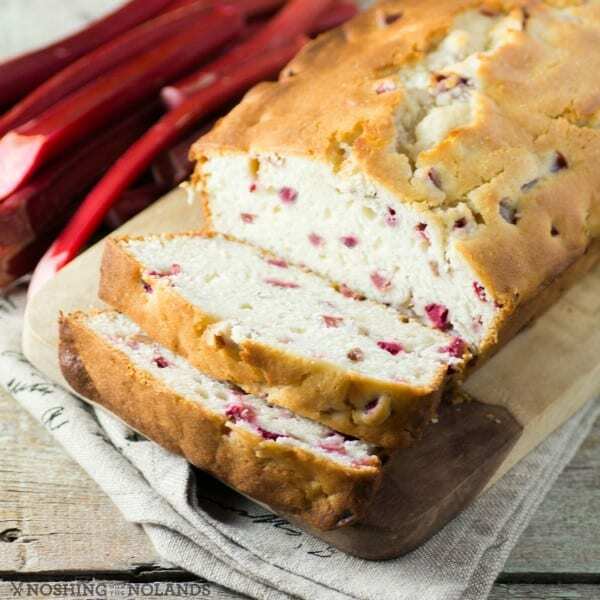 My rhubarb patch was purely the inspiration for this Old Fashioned Rhubarb Loaf. The weather seems to be changing a lot for us all. With a very dry spring, I therefore let my rhubarb stay in the ground longer. My stalks were short and stunted due to lack of rain but after the last two or three weeks of deluge rain they are plumped up and are now bright ruby red. Just perfectly ready for picking and baking. Although rhubarb is not a true fruit, it is usually prepared as one. The leaves are highly poisonous, so discard those quickly. The long stalks are sour and bitter if not added into something sweet like this delicious loaf. You may be shocked by the different kinds of rhubarbs, since there are so many varieties. I am not certain of the ones we have planted as they we here when we bought the house. The stalks are smaller than some and much redder in colour too therefore giving all my desserts a lovely colour. 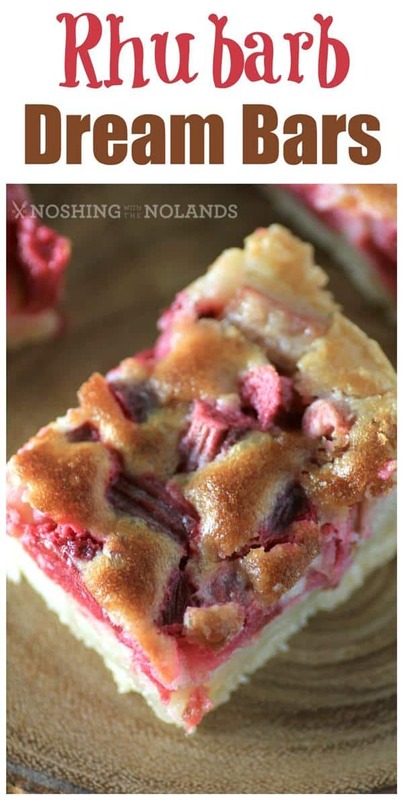 Most noteworthy are these Rhubarb Dream Bars and you can see the gorgeous colour the rhubarb adds to this dessert. The lovely colour and gorgeous recipe consequently has made this one of our most popular recipes. To make this delicious loaf even moister I added in sour cream. I love how wonderful this is for a breakfast item but it also carries you right through the day for coffee or tea or a dessert. A snack for the kids anytime of day too. Our daughter does not like cake very much but give her a delicious loaf like this one and she is in love. She loves devouring not one but two slices right away. I don’t mind as I know what goes into this loaf, nothing but old fashioned goodness. Here are the Rhubarb Dream Bars I spoke to you about in the beggining. Get yourself extra rhubarb, maybe you will be wanting to make both recipes!! 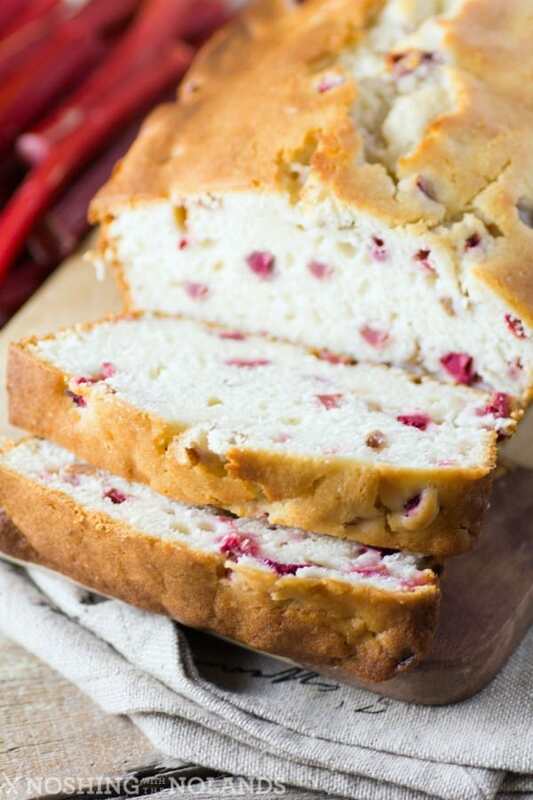 Old Fashioned Rhubarb Loaf Recipe Type : Dessert Cuisine: American Author: Tara Noland Prep time: 10 mins Cook time: 70 mins Total time: 1 hour 20 mins Serves: 1 loaf An Old Fashioned Rhubarb Loaf that is very easy to make and the moist cake will be enjoyed by all. Preheat oven to 350F. Spray a 9x5x3" loaf pan with cooking spray and set aside. Whisk together the flour, baking powder, baking soda and salt, set aside. In the bowl of a standup mixer cream the butter and sugar together until fluffy. Add the eggs one at a time mixing well after each then add the vanilla. Alternatively add the flour with the milk and sour cream, starting and finishing with the flour. Mix well. Fold in the rhubarb. Pour into the prepared loaf pan, smooth top and bake for 60-70 min. until a tester comes out clean. Let cool 10 min. and then remove from pan and cool further on a wire rack. Store in an air tight container for a few days if needed. Those look so good. Can you believe I have never tried Rhubarb? It is not grown a lot in our area, but I am going to remedy that by planting some in our garden so I can try your recipes. I have never had rhubarb loaf. It looks really good though. I may try it soon. My neighbor always gives us his rhubarb when its ready for picking. It will be a nice change from the strawberry rhubarb pie that we always make. That look so good! I love strawberry rhubarb pie, and I just know that rhubarb is going to be delicious in a sweet bread like that. Yummo! My husband would love this. I am going to have to whip this up. This looks really good. I’ve never been much of a fan of rhubarb though. I would still like to try out the loaf. It does sound good. Oh my! Both recipes look delicious! My family would love them. I’m sharing these recipes with my daughter-in-law. Thanks!! This looks like it would be perfect for breakfasts or snacks. I’ve never had rhubarb before but this would be a delicious way to try it for the first time. This looks like a delicious recipe. I will have to get the ingredients I need to make this on the weekend. I have some frozen rhubarb I can use. I love Rhubarb recipes. I am going to try this for dessert tomorrow. My family will love it. This recipe looks splendid! I have never tried rhubarb in a dessert and guess I should give it a go! Thank you, I made this yesterday and it is delicious. I plan to try it again and add nuts and/or lemon zested sugar topping but really it’s perfect as is. Guess what – it’s gone already, that’s always a good sign! Excellent, so glad you liked it!! A but the instructions don’t indicate when to add it. Sorry, I have updated the recipe now, I always add the vanilla after the eggs. Could you do half and half strawberries and rhubarb in this recipe? I would say yes, give it a go. Strawberries and rhubarb go hand in hand!! Tell me how it turns out!! Can’t wait to pick my rhubarb. Has anyone tried reducing the sugar? I usually half what recipes call for but rhubarb usually needs the help. Thoughts? I hear what you are saying with the rhubarb needing more sugar. Maybe I would go with 3/4 cup and try that. I think that would be okay. Do you know if this loaf is freezable? Most loaves are freezable. Although I have not frozen this one in particular I think you would be just fine in freezing it. Is it possible to change to metric measures? As in weight Roman? Then I am not sure, sorry. How much butter with the loaf ? 1/2 cup the recipe says, is there something else you need? Do you think you could use frozen rhubarb? 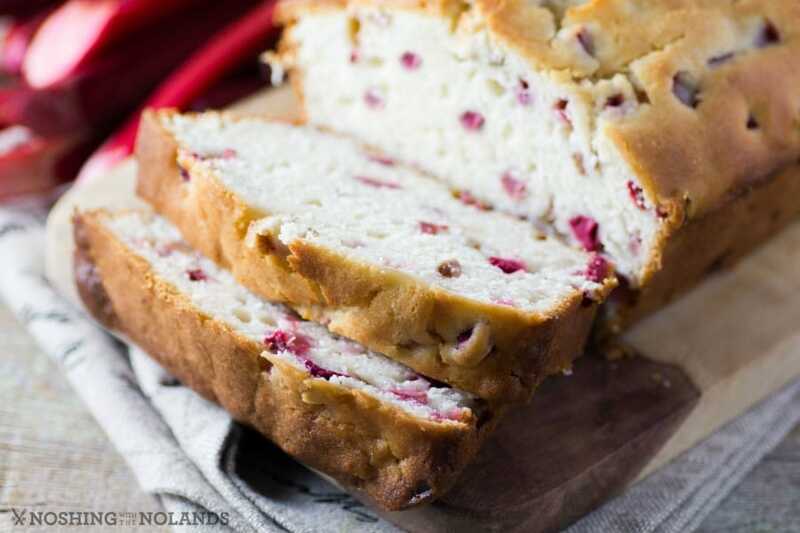 I have excess in my freezer and looking for new recipes to try and this loaf looks amazing! I am not sure Tami if you can or not. I use frozen more for compote, pies, and just used it for ice cream. If your rhubarb is already small diced then I would say yes, if you have to defrost it and try to cut it I think it will get too watery. I hope you enjoy it!! Try searching some of our other rhubarb recipes. 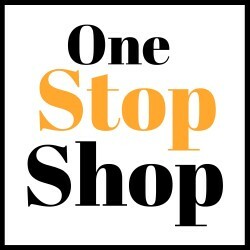 We have lots!! Cheers!! i just put my second batch of this in the oven! I did make a few changes, but the idea is the same. i used greek yogurt instead of sour cream, half whole wheat flour, and added a generous amount of cinnamon (because who doesn’t love cinnamon??). I also made it in 4 mini-loaves and sprinkled sugar on top so it got a nice crunch on top. my first batch i used 1.5 cups of rhubarb, and i felt like i could go more, so i used up the rest of the rhubarb i had in this batch–a little over two cups! i think it’ll still be fine. i devoured the first batch so fast it was slightly embarrassing, and i expect the second batch to go the same. definitely one of my new favorites! Sounds awesome, so glad you are enjoying the loaves! I mad eyes this loaf and it turned out perfect, except for taste. The cake is great but the fruit is sour and I will not be making again. I wasted a good cake and my rhubarb. I guess you like it sweeter than most, maybe adding more sugar would have helped you. I’ve made this bread a bunch of times already and every time I think I want to try something new, I come back to this recipe. I was out of sour cream one time but substituted with plain Greek yogurt, and that turned out great. I love the tartness of rhubarb in this bread! I am so happy you love this bread, I will have to try it with Greek yogurt, mmmm! These recipes look nice! I have never fixed or eaten rhubarb before. Do you use unsalted butter & all – purpose flour? Can skim milk be used? Should the butter & eggs be @ room temperature? Thank you! I use regular butter, all-purpose flour, you can use skim, 2% or whole milk. I haven’t brought the eggs to room temperature for this recipe. We sure love our rhubarb here! !